The C2C Zipper pouch is a quick project that is a perfect first project to make when learning the corner to corner crochet . A C2C Zipper pouch works up in an evening and can be made with some spare medium weight yarn. The C2C Zipper Pouch in one of the practice patterns designed for the How to Corner to Corner Crochet – Crochet A Long. Join our crochet community on the Our Crochet Journey Facebook Group, where we are learning this stitch together. If you like C2C Crochet, check out some of the other free patterns I have designed below or all my free patterns here. If you want to learn more about Corner to Corner Crochet or just know when I release new patterns, sign up for my newsletter. C2C – Corner to Corner Stitch – Find the Photo and Video Tutorials Here! Zipper Pouch measures 8 inches by 4 inches once sewn together. You will be using the Corner to Corner Crochet method to create a 14×14 square, then edging the square with a single crochet border. R2-14: Ch 6, Dc into the 4th, 5th, and 6th chain from the hook. (Slst to the turning chain of the previous row, Ch 3, Work 3 Dc around the turning chain you Slst to.) Repeat from (to) to the end of the row. R15-27: Turn, Slst to the last 3 Dc of the previous row, Ch3, turn. Work 3 Dc around the turning Ch of the previous row, *Slst to the next turning Ch, Work 3 Dc around the turning Ch of the previous row,* repeat from *to* until you are even with the top of the previous row. To give this pouch a little more detail I added a single crochet border in an accent color. This also makes it much easier to sew together. So add a Single crochet border, follow the Video Tutorial below or see the photo tutorial here. Using a yarn needle and yarn, use a running stitch to sew up the sides of the pouch. Check out my video tutorial Sewing for Crocheters if you need any guidance on sewing. Next use another running stitch to sew in the zipper. Be sure to leave a little space between the zipper and the top of your pouch to prevent your yarn from getting stuck when you open and close the pouch. I wanted to store my hooks in one of my pouch and my yarn money in another. To keep my coins and tools from coming out through the holes in the fabric, I knew I needed a liner. I wasn’t really in the mood to drag out my sewing machine, so I designed a no sew alternative. Please note that in the photos I cut my fabric an inch too short. Follow the written instructions for yours to come out right. Cut a piece of cotton fabric 9 inches by 10 inches and a piece of two sided fusible interfacing 9 inches by 8 inches. Next, fold the edges of the cotton fabric in so that it is the same size as the interfacing. Iron the fabric to keep the folds in place. I angled my corners to make them look nicer. Using a low setting on the iron, gently iron the interfacing until it fuses to the cotton fabric. Take your finished c2c zipper pouch and turn it inside out. Remove the paper from the other side of the interfacing and place that against the inside of the zipper pouch. Using a low setting on the iron carefully iron the fused fabric and interfacing until it has fused with the pouch. NOTE: Acrylic yarn can melt if the iron is too hot. Use a low setting and keep moving the iron to slowly heat the fabric and interfacing just enough to fuse. Once the interfacing is fused, allow it to cool before turning the the pouch over and doing the other side. Once both sides are completed. Allow the second side to cool and then turn the pouch right side out. Now you have a pretty liner without sewing. 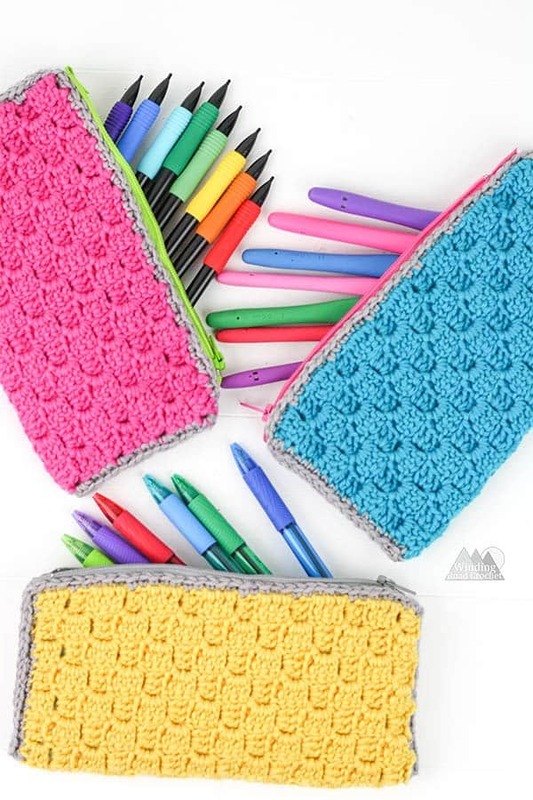 Your C2C Zipper Pouch is complete and ready to be filled with pens, pencils, crochet hooks and more. Are you going to make a C2C Zipper Pouch for yourself? I would really like to see your finished crochet spouch, take a picture and share it with me on any social media! Just tag me @windingroadcrochet, #windingroadcrochet, or #ourcrochetjourney. Join my Facebook Group and share your creation with the community at Our Crochet Journey Facebook Group! Written pattern, tutorials, graphs and pdfs of the C2C Zipper Pouch are copyright Windingroadcrochet.com. Please do not reprint or repost this content as your own, but please feel free to share this link with others. You can find more information on sharing my work with others in the Terms and Conditions Page.